Usain Bolt: Nominated for IAAF’s Male Athlete of the Year award. 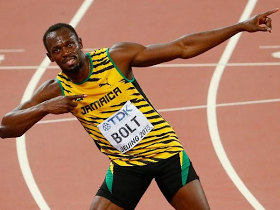 World’s fastest man, Usian Bolt has been nominated by The International Association of Athletics Federations (IAAF) for ‘Male Athlete of the Year award’. The award night which will take place at Monaco on Friday, December 2, 2016, will see the nine-time Olympic gold medalist alongside Mo Farah (GB), Eliud Kipchoge (Kenya), Ashton Eaton (USA)Conseslus Kipruto (Kenya): Omar McLeod (Jamaica) David Rudisha (Kenya), Christian Taylor (USA) , Wayde van Niekerk (South Africa), and Thiago Braz (Brazil) battle for the award in the Men’s category. While in the women category, Caster Semenya (South Africa) will battle Almaz Ayana (Ethiopia), Ruth Beitia (Spain), Vivian Cheruiyot (Kenya), Kendra Harrison (USA), Caterine Ibarguen (Colombia), Ruth Jebet (Bahrain), Sandra Perkovic (Croatia), Elaine Thompson (Jamaica) and Anita Wlodarczyk (Poland) for ‘Female Athlete of the Year award’.